Do you have ancestry in the Gold Coast region? 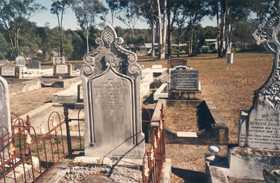 Eagleby Cemetery is located in Herse's Street, off Fryars Road, Eagleby, in the Gold Coast City area of Queensland. A monument commemorates the arrival and settlement of the Zornig family at Eagleby in November 1865. Several headstones remain standing, recording deaths in the 1880's - the earliest being 1883. This transcript was made in February 1996 and is an absolute treasure for anyone looking for ancestors in this region to build a family tree or learn more about their family history.